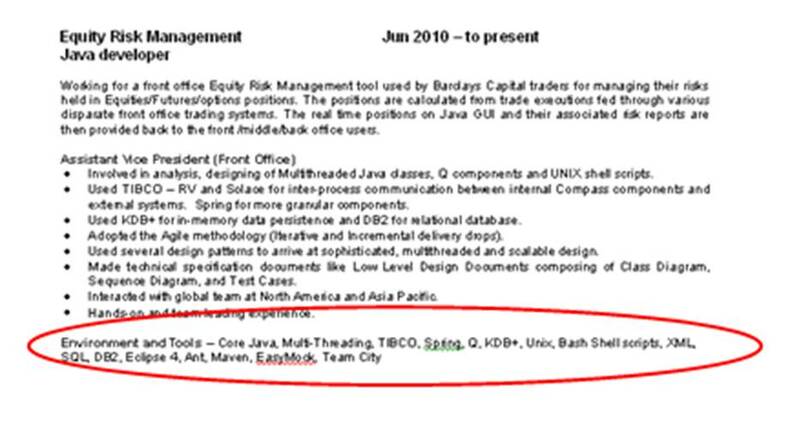 It’s just occurred to me that a lot of java developers get the technologies list part of their CVs all wrong. In each description of the jobs they have had they seem to want to tell their potential employer what all of the technologies their team was using… what’s the point of that? Rather than telling them what you are good at, all you’ve done is invite an interviewer to ask you questions about technologies that you don’t know much about. It’s much better to simply list the technologies that you are skilled at. And I think a good rule of thumb is, if you wouldn’t rate yourself as a 7 or above on a skill, you shouldn’t include it in a job description – that way your CV is giving a true representation of what you are good at rather than making you look like you’ve got an ego problem. If it’s an interesting technology that you have some exposure to, it’s much better to put it in your Technical Skills box at the start of your CV. In this case, less really is more. Java 6, Flex 4, Parsley 2.2, Spring Framework 3, Spring Security, Spring-Flex, Hibernate 3.5 (JPA), Weblogic 10, Tomcat 6, Oracle 10g, SUSE Linux, Maven, Nexus, Team City, SVN (Subclipse). LDAP security integration (Spring-LDAP), Reuters IDN-SELECTFEED (RFA), Fidessa (live streaming), Cairngorm Granite ActionScript generation (GAS), Ehcache, BlazeDS, Dozer, Apache utils (commons, math), integration with Oracle Coherence caches, Web Services, remote databases (SQL Server, Sybase, DB2), data streams. Fully automated unit and integration testing using TeamCity, Spring TestContext Framework, JUnit, Mockito, HSQLDB. I mean, really??? Really?? In 3 months? Pull the other one. All this guy is doing is setting himself up for some tough interview questions on technologies that he’s only got a high level understanding of. This entry was posted in CV tips. Bookmark the permalink.